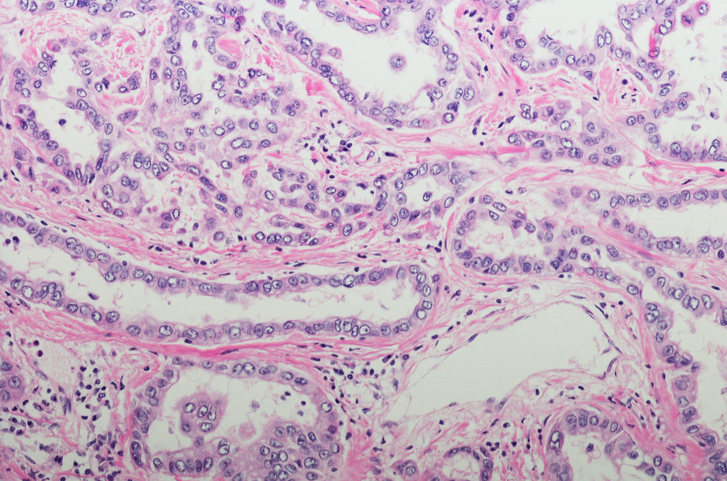 IMPRINT (intensity-modulated pleural radiation therapy) is showing promise as part of a multidisciplinary approach to treating pleural mesothelioma. This type of radiation therapy helps minimize excessive toxicity to the impacted lung following pleurectomy and comes with a manageable rate of side-effects according to a recent study. This same study found that patients who underwent pleurectomy and IMPRINT saw a 6% increase in survival rates at one year and an impressive 29% increase by year two compared with unresectable patients. When combined with a positive response to chemotherapy survival rates increased even more, reaching 100% at one year for patients with at least a partial response to chemo medications. 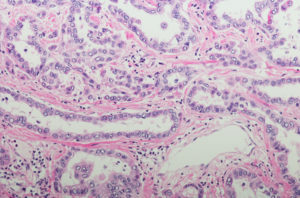 A micrograph of pleural mesothelioma, a rare and aggressive form of cancer caused by asbestos exposure. There is a growing belief among mesothelioma specialists that pleurectomy, which spares part of the lung, is preferable to extrapleural pneumonectomy, during which the entire lung is removed. However, the most common methods of radiation therapy increase risks for radiation pneumonitis when part of the lung remains. IMPRINT has shown to deliver safe levels of radiation following pleurectomy while reducing risks for regional recurrence. Out of the 27 participants in this study, none experienced grade four or five radiation pneumonitis during the course of treatment. Eight developed grade two or three radiation pneumonitis, though all recovered quickly following corticosteroid treatment. As with all mesothelioma treatments, what works best for you will be dependent on a variety of factors. New York mesothelioma attorney Joseph Williams can assist you in getting the compensation you will need to get the most effective treatments for your body. To schedule a free consultation at the Manhattan office of The Williams Law Firm, please contact us online or call 855-575-MESO (6376) today.